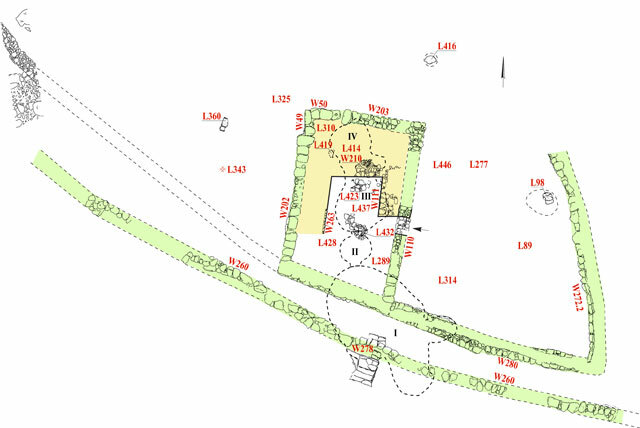 In July 2013, an archaeological excavation was conducted inside the hall of the Second Temple period synagogue at KhirbatUmm el-‘Umdan in Modi‘in (Permit No A-6837; map ref. 199819–36/643443–54; Figs. 1, 2), prior to the installation of columns designed to support a roof. The excavation, on behalf of the Israel Antiquities Authority, was directed by S. Weksler-Bdolah, with the assistance of T. Nachmana (administration), T. Asemahagn and A. van Zuidan and a group of laborers from the Israel Antiquities Authority Conservation Department, V. Essman and Y. Shmidov (surveying and drafting), A. Peretz (field photography), D.T. Ariel (numismatics), S. Rosenberg (art), R. Bar-Nathan and D. Sandhouse-Re‘em (pottery reading), B. Ouahnouna and Y. Gorin-Rosen (glass identification), I. Lidski-Reznikov (pottery and glass drawing) and C. Amit (studio photography). The hall of the synagogue was first discovered in salvage excavations conducted at the site in 2001–2002 (Onn et al. 2003; Onn and Weksler-Bdolah 2006; for the synagogue structure, see Onn and Weksler-Bdolah 2005; Weksler-Bdolah, Onn and Rapuano 2003; Onn, Weksler-Bdolah and Rapuano 2004; Onn and Weksler-Bdolah 2008). In the past, three main development phases were identified in the synagogue’s structure. The latest phase (the Herodian Period) comprised a hall surrounded on four sides by benches, with two rows of four columns running the length of the hall to supported its ceiling (Onn and Weksler-Bdolah 2008:2062–2063, The Herodian Period, Herodian period synagogue). This hall is similar to others from the Second Temple period that are usually identified as synagogues (at Kiryat Sefer, Herodium, Masada, Gamla and Migdal). This hall was preceded by a narrower hall, which was built in the Hasmonean period (late second century or early first century BCE) and also had wide benches arranged along its walls; we have suggested that this narrow hall was also a Jewish public building that served as a synagogue (Onn and Weksler-Bdolah 2008:2061–2062, The Hasmonean Period, Hasmonean period synagogue). Under the Hasmonean hall was an Early Hellenistic hall from the Seleucid period (second century BCE). Throughout these periods, a large courtyard extended east of the structure. The public building was always entered from this courtyard: in the earliest phase, a narrow corridor led from the courtyard to an entrance set in the western wall of the hall; however, from the Hasmonean period onward, the entrance was set in the hall’s eastern wall, and this main entrance was entered directly from the courtyard. 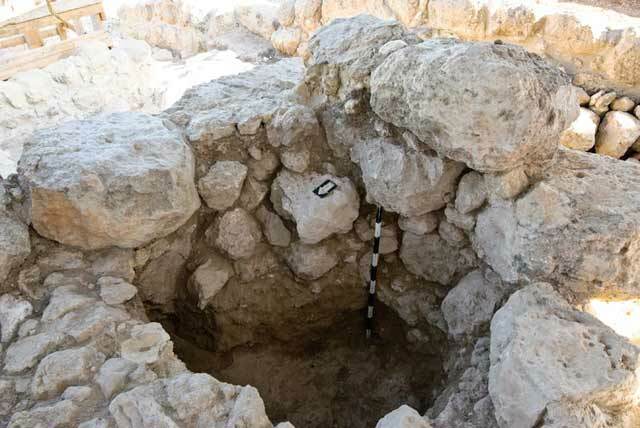 The current excavation was carried out as part of the conservation and reconstruction work conducted by the Israel Antiquities Authority Conservation Department. Four squares (1300, 1350, 1400, 1450; c. 1 × 1 m each; Figs. 3, 4) were excavated in the four corners of the synagogue’s hall. 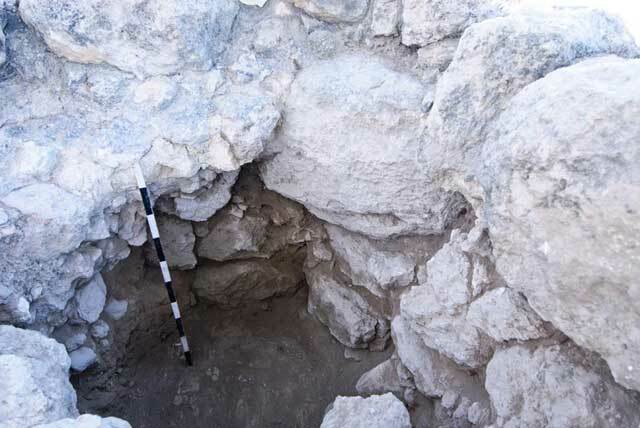 The probes were excavated either down to the bedrock or about one meter below the present surface. The Early Hellenistic Hall (Fig. 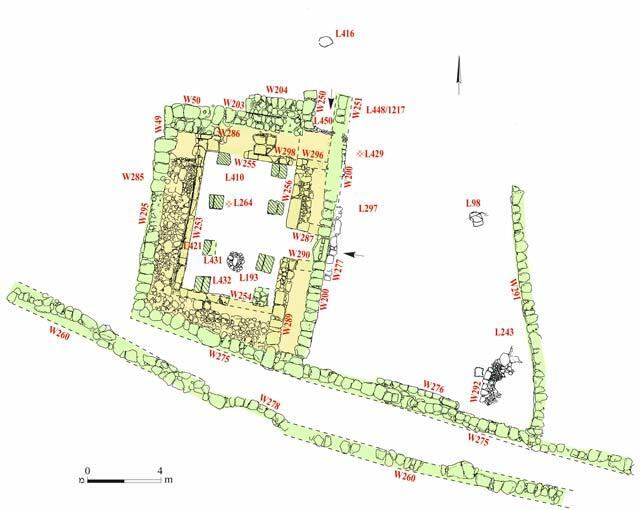 5) was only partially unearthed in the previous excavations, and its rectangular plan (3.8 × 7.0 m) was reconstructed on the basis of the wall and floor segments that were exposed. The entrance to the hall was apparently fixed in the center of the western wall. A narrow, L-shaped corridor leading to the opening was built around the southern and western sides of the hall. Six Seleucid coins dating to the reigns of Antiochus III and Antiochus IV (IAA 92217, 92223–92225, 92237, 92248) and fragments of pottery vessels ascribed to this period were discovered on the floors of the hall and of the courtyard and in the alley to their south; these finds provide a date for the hall’s use. The function of the hall at this time remains unknown; however, based on its plan—a single central space—it seems to have been a public building. This hypothesis is corroborated by the fact that public buildings, which we suggest were synagogues, were constructed directly over the Hellenistic hall. Evidently, the plan of the Hellenistic hall and its location in the settlement dictated the general shape of the synagogues that were constructed above it in later periods. 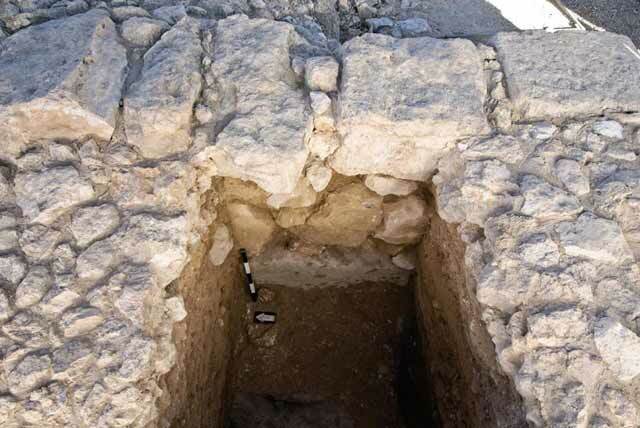 In the current season of excavations, a hewn bedrock step was discovered in Sq 1350 (1 × 1 m), exactly where one entered from the courtyard into the peripheral entrance corridor. It seems that the rock-cut step marks the original entrance from the courtyard of the Early Hellenistic building to the peripheral corridor (Fig. 4: Sections 4–4, 5–5). In the Hasmonean period, a wall was built over the opening and blocked it (W289; Fig. 6), and was later integrated in the Herodian synagogue’s eastern bench (below). The Hasmonean Synagogue (Fig. 7). A slightly larger structure (6.7 × 10.5–11.5 m), identified as a synagogue, was built in the Hasmonean period above the Early Hellenistic hall and its peripheral corridor. The hall’s entrance was fixed in the middle of its eastern wall. A U-shaped array of benches ran the length of three of the walls, although not parallel to them. The many fragments of red, yellow and white plaster discovered in the previous excavation above the floor of the hall indicate that the walls were decorated with colorful frescoes. The frescoes were painted in the secco technique, and were dated according to their style to the Hasmonean–Herodian periods (the first century BCE, prior to the year 15 BCE). 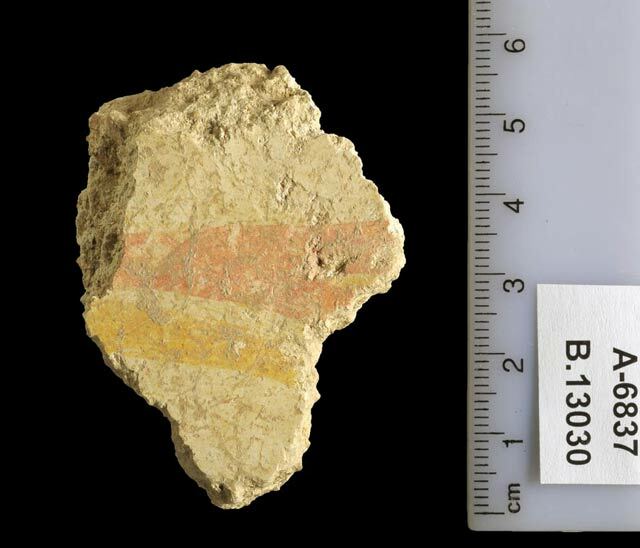 Similar wall paintings were found in Jericho, Jerusalem and elsewhere (the frescoes were studied and identified by Dr. Sylvia Rosenberg, and they will be published in the final excavation report). The date of the hall was determined on the basis of five Hasmonean coins from the time of John Hyrcanus and Alexander Jannaeus, which were discovered in the hall in the past (IAA 92213, 92227, 92233, 92235, 92421), and numerous fragments of pottery vessels from the Hellenistic–Hasmonean periods. An additional, ex-situ coin (Basket 13023; IAA 143558) that belongs to this phase was discovered during the current excavation season inside the synagogue hall, on top of the built bench from the Herodian period (below). 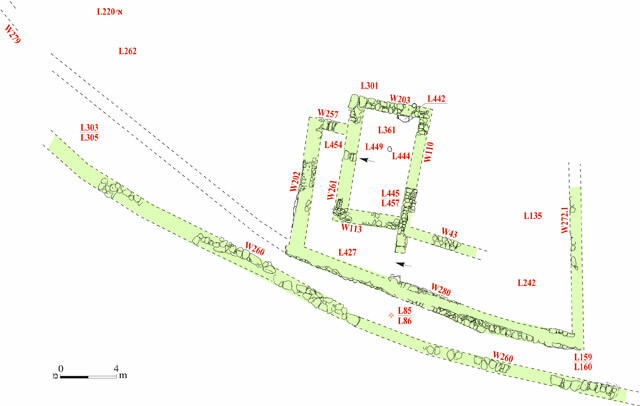 The current excavation exposed the outer courses of the outer walls of the Hasmonean hall, which were built of large, fairly coarse and only partially hewn stones (Fig. 8); they continued to be used in the Herodian structure. In the conservation work that preceded the excavation, a fragment of a fresco made in the secco technique (Fig. 9) was discovered in the synagogue. Its style is similar to that of a group of wall-painting fragments that were discovered in the past above the floor of the Hasmonean phase, and probably originated from the walls of the hall. A tamped-earth floor (L1302; Fig. 10) that belongs to either the courtyard of the Early Hellenistic hall or to the courtyard of the Hasmonean synagogue was exposed in Sq 1300 (1.2 × 1.7 m). 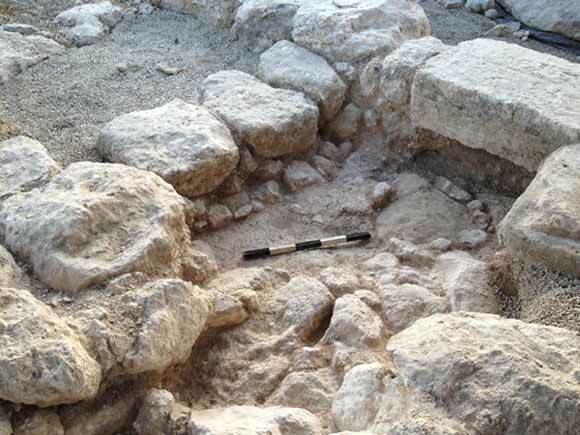 In the west, the floor was integrated with stones (L1303), but since only a limited area was exposed it could not be determine whether these stones, which protruded to a higher elevation than that of the preserved floor, were part of the floor foundation, severed it or belonged to W110. A jar with an everted and folded rim that dates to the Hellenistic/Hasmonean period (Fig. 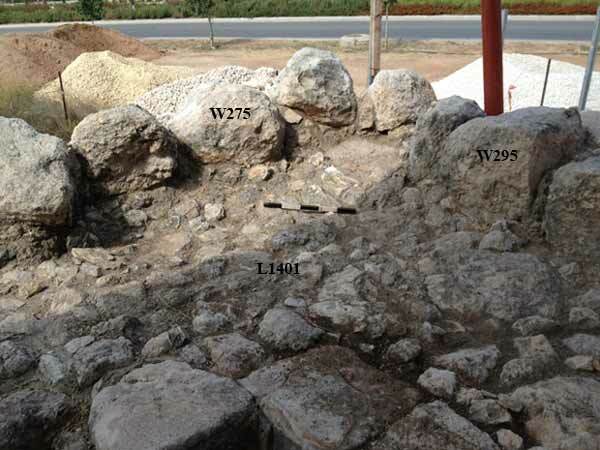 11:1) was discovered among the stones of L1303, and it therefore appears that Floor 1302 and Stone Heap 1303 belong to the courtyard of the Hellenistic or the Hasmonean hall, prior to enlarging the structure during the Herodian period. A fragment of a bowl with a thickened rim, dating to the Hellenistic/Hasmonean period (Fig. 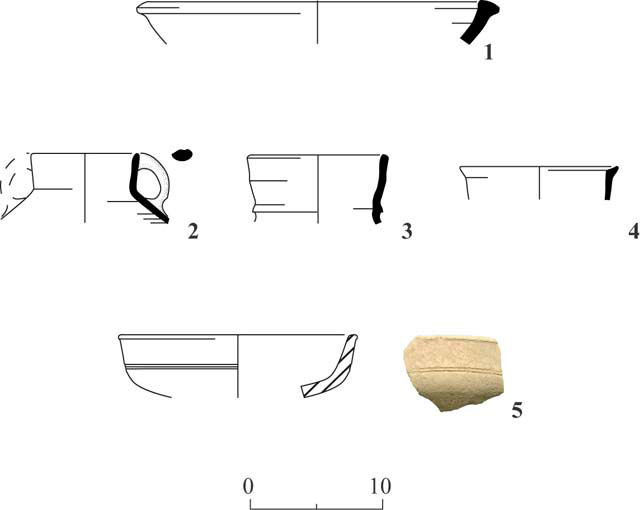 11:2), and fragments of two bag-shaped jars with upright necks and straight or thickened rims of the type common in the Herodian period (Fig. 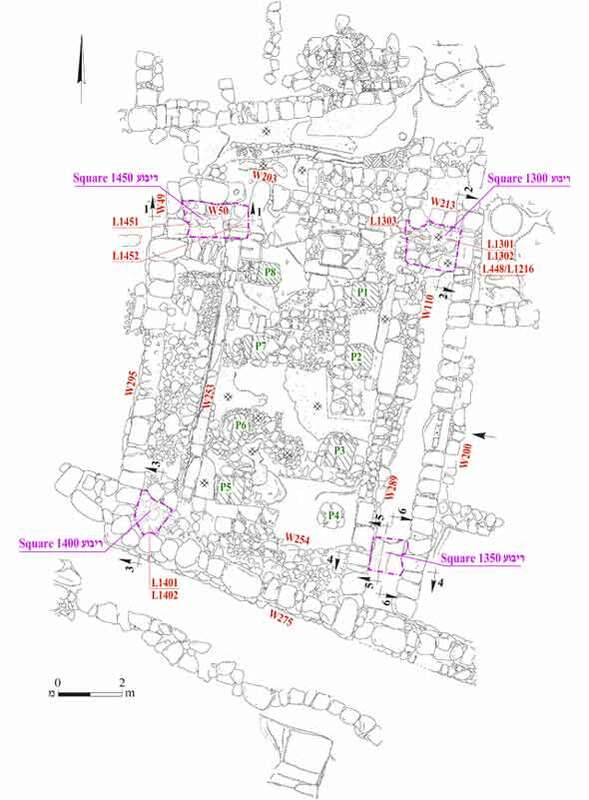 11:3, 4) were discovered in the fill (L1301) above Floor 1302. The Herodian Period. During Herod’s reign, a new, broader hall was constructed over the Hasmonean synagogue. The Herodian hall (8.6 × 10.5–11.5 m; Fig. 12) utilized the northern, western and southern walls of the Hasmonean hall, while a new wall (W200) was built in the east, parallel to the eastern wall of the Hasmonean hall and c. 1.7 m to its east. The main entrance to the hall was incorporated in the center of the eastern wall, and another opening was fixed in the northern wall, near the hall’s northwestern corner. The hall during this phase was characterized by two rows of four columns each (Fig. 3: P1–P8) and two or three stepped benches (overall width c. 1.7 m) that encompassed the hall on all four sides and were built parallel to its walls. The core of the benches (L1401) was built of medium-sized fieldstones arranged one next to the other, with only earth between them and no mortar (Fig. 13). The floor of the hall was made of tamped earth, and in a later phase, probably in the early first century CE, a new plaster floor was installed above it that extended up onto the benches. The similarity of the Herodian hall to the Hasmonean hall on the one hand and to buildings identified as synagogues at Masada, Herodium, Gamla, Migdal and Kiryat Sefer on the other, allow us to conclude with a measure of certainty that the Herodian structure is a synagogue. 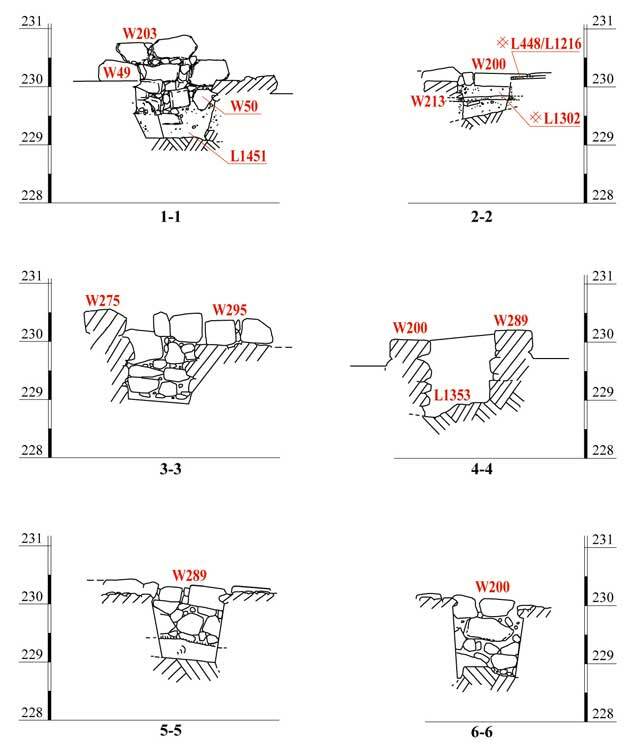 During the current excavation, the core of the Herodian benches (L1401) was dismantled in the southwestern corner of the hall (Sq 1400; 1 × 1 m), and the excavation continued into soil fill that contained fieldstones (L1402; Fig. 14). While taking apart the core of the benches, a Hasmonean coin of the Palm-Branch Type (Basket 13023; IAA 143558; identified by D.T. Ariel) was found between the stones at the top of the bench. The worn condition of the coin does not allow us to identify whether it was minted during the reign of John Hyrcanus or of Alexander Jannaeus, and is therefore dated between 129 and 76 BCE. 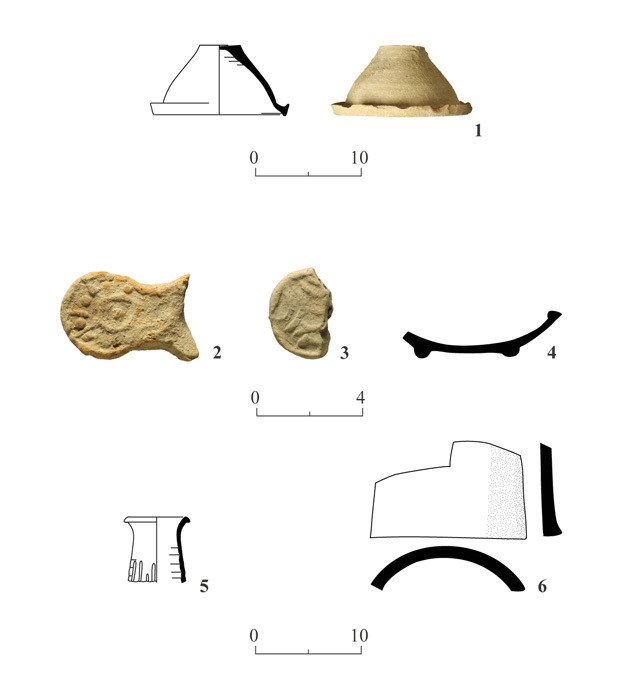 The pottery sherds recovered from the core of the benches included jar fragments, the most common of which were bag-shaped jars with upright necks and a variety of rims—plain, thickened with a triangular cross-section, or collared—typical of the first century BCE (Fig. 15:1–8). Some of the jars have a slight ridge at the base of the neck. Among the other ceramic finds were a cooking pot with an upright neck and a thickened rim (Fig. 15:9); a thin-walled jug with a rim that widens outward (Fig. 15:10); a large utility jug with a broad neck, a short, everted rim and a handle drawn from the rim to the shoulder (Fig. 15:11); and an amphoriskos with a cup-like rim and a slightly twisted handle (Fig. 15:12). These vessels are typical of the first century BCE—the Hasmonean period and the time of Herod’s reign. A base ring of a bowl, red-slipped both inside and outside (Fig. 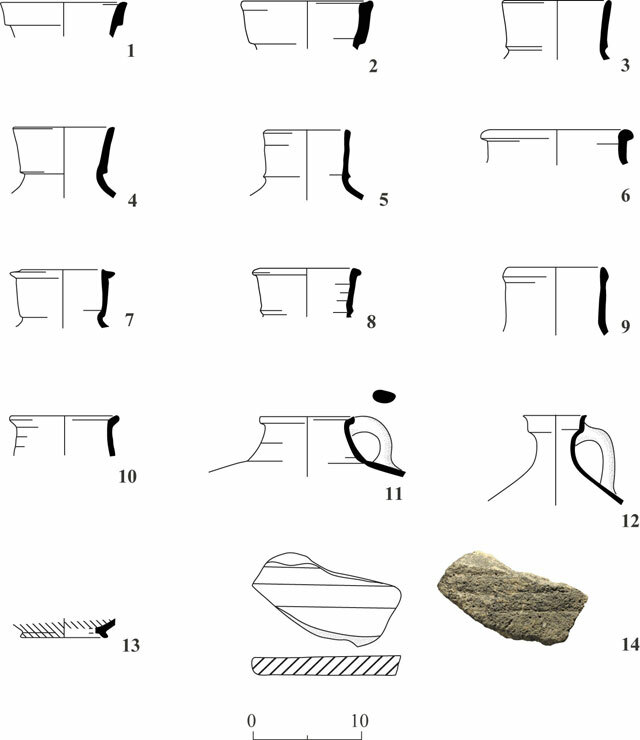 15:13), which possibly dates to an earlier period, and a fragment of a basalt grindstone (Fig. 15:14) were also found. The finds recovered from the soil and stone fill below the core of the bench (L1402) include a large bowl with a thickened rim from the Hellenistic period (Fig. 16:1), a cooking pot with a high neck characteristic of the Hasmonean period (Fig. 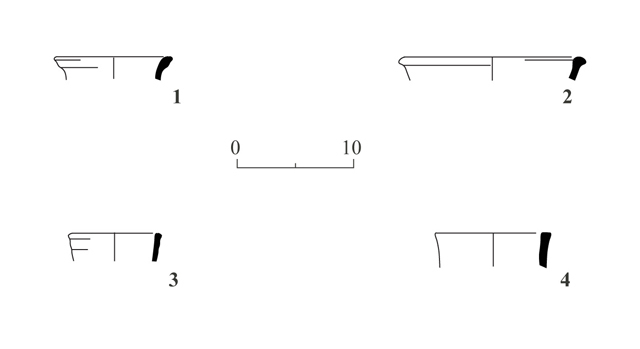 16:2), bag-shaped jars similar to those discovered in the core of the bench (Fig. 16:3, 4) and a stone bowl decorated with incisions (Fig. 16:5). In Sq 1450 (1 × 2 m), the northwestern square, a row of stones (L1451) that was used to thicken the inside corner of the hall (W49, W50) was dismantled, exposing the walls of the hall, which were built of large, coarse rocks (Figs. 3: Sections 1–1; 17). The excavation reached down to the bedrock in the corner of the hall. The soil fill that was excavated was not sealed by the core of the bench, as it was not preserved there. In the soil and stone fill below the wall addition (L1451) were a jar typical of the Hellenistic/Hasmonean period (second–first century BCE; Fig. 18:2), a bag-shaped jar with a high neck and a plain rim characteristic of the Herodian period (Fig. 18:3), and a jug with a rim that widens toward the outside and a handle drawn from the rim to the shoulder, which was common in the Hasmonean period (second–first century BCE; Fig. 18:4). An ash level covering the bedrock, the nature of which was not ascertained (possibly an installation; L1452), included a fragment of a hemispheric bowl common in the second–first century BCE (Fig. 18:1). The excavation below the benches in the corners of the hall revealed the lower courses of the synagogue’s outer walls, which were previously unknown. The synagogue walls were built of large, partially hewn, coarse boulders placed on top of each other in dry construction (the mortar might have been washed away in the past). Small fieldstones were placed between the larger stones in order to level the courses. 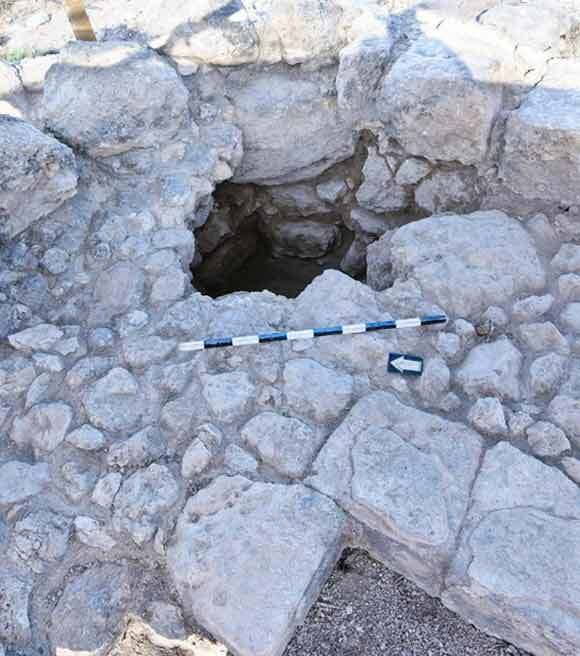 The ceramic finds discovered when dismantling the core of the benches in the southwestern corner of the Herodian hall (L1401, L1402) indicate that the benches were built in the first century BCE. The finds confirm the conclusions drawn after the previous excavation, according to which the synagogue hall with the row of columns running its length and the stepped benches along its walls dates to the reign of Herod (the second half of the first century BCE). Meager remains of earlier floors and installations (L1302, L1303 in the northeastern square and L1452 in the northwestern square) were dated to the Hellenistic–Hasmonean periods (second–first centuries BCE) and they belong to earlier phases of the hall—the Hasmonean and the Early Hellenistic phases; however, it is impossible to identify their exact nature. Building 9. Conservation work, without an excavation, was carried out near Building 9, in the eastern part of the site. The building was dated in the previous excavation to the sixth–eighth centuries CE. During the conservation work, an assemblage of pottery and glassware characteristic of the Late Byzantine and Umayyad periods (sixth–eighth centuries CE) were found. The finds included an intact jar lid (Fig. 19:1) and other lid sherds of the same type; decorated handles of oil lamps (Fig. 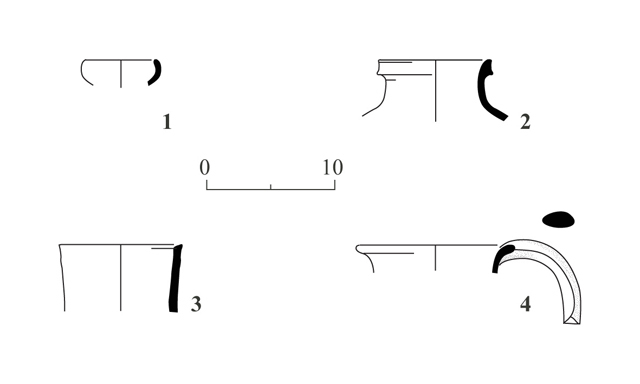 19:2, 3); a base ring of an oil lamp (Fig.19:4); a jug (Fig. 19:5); and a piece of a terra-cotta pipe (Fig. 19:6). 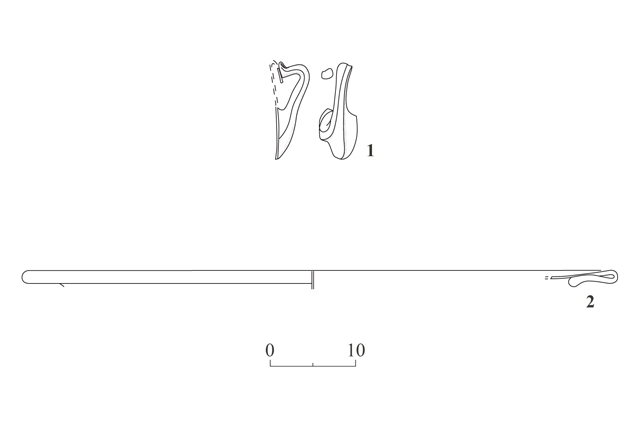 Other artifacts discovered include two fragments of glass vessels (Fig. 20: 1, 2); a handle of a Byzantine bowl lamp, which usually has three handles and is characteristic of the sixth–eight centuries; and a fragment of a round window pane with a folded and thickened edge, characteristic of the Byzantine period. Onn A. and Weksler-Bdolah S. 2005. Horbat Umm el-‘Umdan - a Jewish Village with a Synagogue from the Second Temple Period at Modi‘in, Qadmoniot 130:107–116 (Hebrew). Onn A. and Weksler-Bdolah S. 2006. 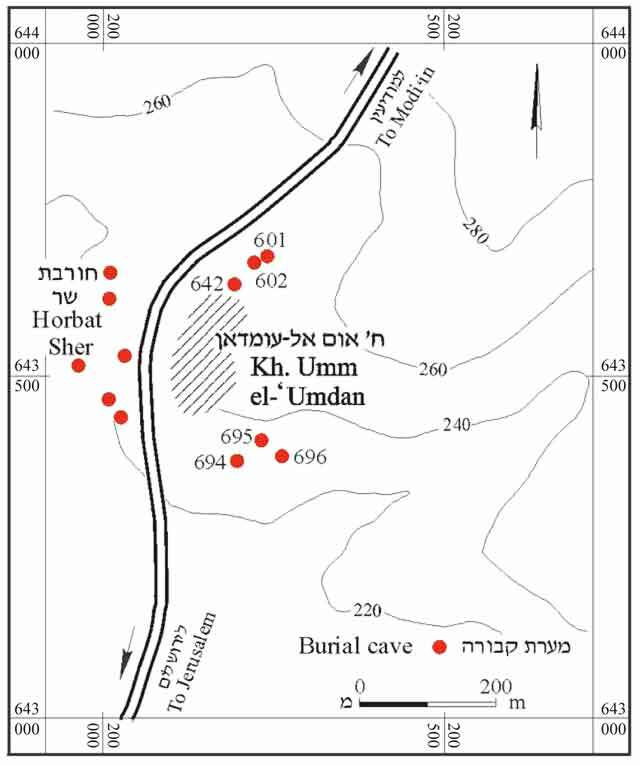 Khirbat Umm el-‘Umdan HA-ESI 118. Onn A. and Weksler-Bdolah S. 2008. Khirbet Umm el-'Umdan. In NEAEHL 5. Pp. 2061–2063. Onn A., Weksler-Bdolah S. and Rapuano Y. 2004. A Synagogue of the Second Temple Period at Horbat Umm El-‘Umdan in Modiin. In Y. Eshel, E. Netzer, D. Amit and D. Cassuto eds. And Let Them Make Me a Sanctuary: Synagogues from Ancient Times to the Present Day. Ariel. Pp. 25–30 (Hebrew). Onn A., Weksler-Bdolah S., Rapuano Y. and Kanias T. 2002. Khirbet Umm el-‘Umdan. HA 114: 64*–68*. 2. 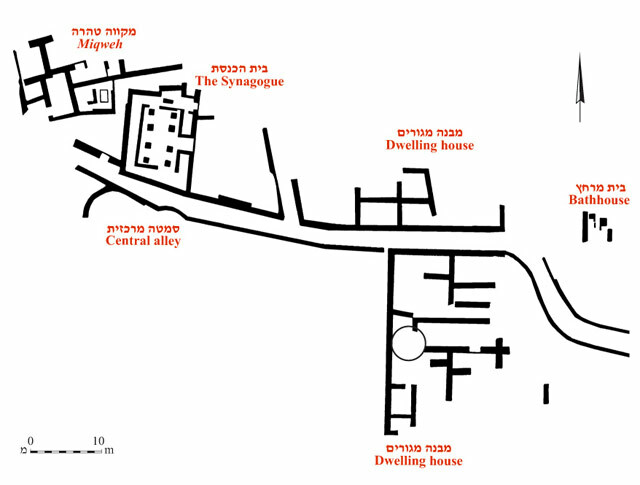 General plan of the remains from the Second Temple period, based on Onn and Weksler-Bdolah 2006. 3. The hall in the Herodian synagogue, general plan and finds revealed in the current excavation. 5. The Early Hellenistic hall, plan. 6. Wall 289, looking west. 7. The hall in the Hasmonean synagogue, plan. 8. Square 1400, looking southwest toward the corner of the Hasmonean synagogue hall: W275 on the south and W295 to the west; within the corner—the core of the benches from the Herodian period (L1401). 9. A fresco fragment from the synagogue’s hall. 10. Crushed Chalk Floor 1302, looking northeast. 11. Pottery from Loci 1301 and 1303. 12. The hall in the Herodian synagogue, plan. 13. Square 1400 prior to the excavation, looking southwest. 14. Square 1400 upon completion of the excavation, looking southwest. 15. Pottery from L1401—inside the core of the bench in the synagogue’s hall. 16. Pottery from L1402—soil and stone fill beneath the core of the bench. 17. Square 1450, the corner of Walls 49 and 50, looking northwest (the arrow is placed backwards). 18. Pottery from Loci 1451 and 1452. 19. Pottery from Building 9. 20. Glass finds from Building 9.